Corbin builds the JRD-1 and JRD-2 jacket reducing die sets, each in type -S (for the 5/8-24 ram S press with 7/8-14 die threads) and in type -H (for the 1.0-12 ram H press with 1.5-12 die threads). In addition, the JRD-1-R die is available for standard reloading presses with a slotted ram. The jacket can be made tougher, for higher velocity. The jacket can be made for a longer, heavier bullet. If you need a jacket for higher velocity, deeper penetration, or faster twist rates, drawing down the next larger caliber jacket that is commercially available may do the trick at minimum cost. Alternatives are to make tubing jackets, draw your own with a Corbin jacket making outfit, or have a commercial production run made to order (minimum orders typically in the 250,000 jacket range or higher). Drawing an existing jacket down can be the lowest possible cost option for you. However, be aware than when the jacket is drawn down, and the base material is drawn into the walls to thicken them, the ID of the jacket is smaller than a standard one. The regular core swage die probably will no longer work with this jacket. A smaller core swage may be required, which in turn may require smaller diameter lead wire or core mould to feed it. The core seating die is the same, but the external core seating punch, which has to fit the ID of the jacket, also may need to be smaller than the standard size for a commercial jacket. A jacket can be reduced much more than a bullet, which typically begins to become inaccurate with .005-.006 inch reduction from original diameter. 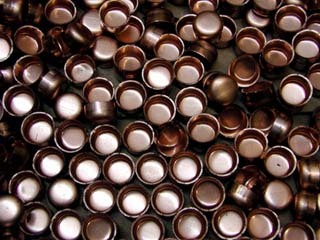 A .308 jacket can be reduced to .264 or .257 with good results, using the proper design of dies, in just two steps. You can make a .308 into a .284 or a .277 (.270 Win) jacket in one step. A .45 pistol jacket can be turned into a .40, a .38, a .338, a .308, a .284, a .257, and even a .224 in a series of steps. A jacket may become longer on one side during this operation, depending on the kind of dies used. The simple JRD-1 dies will give reasonable but not optimal results. They will require an ET-2-S or ET-2-H trim die after several of the steps, in order to make the jacket short enough to fit on the next punch and allow room for more drawing, as well as to trim off the uneven mouth that results. The limit of reduction for one step with a given die design is the amount of off-center drawing that can occur as the difference between the punch diameter and the original jacket base ID diameter becomes greater. For reasonable amounts, up to 15-20%, the jacket can be pre-aligned slightly in the mouth of the die and then drawn without having the punch drift too much to one side of the base. As the reduction approaches 30% the drift becomes large enough to cause concern. Also, the force of drawing goes up as the reduction goes up, and the punch area at the tip becomes smaller in relation to that force. The result can be penetration of the base. To prevent these negative effects, drawing is limited to one or two caliber sizes per step, and done in more than one step for large reductions. Each step is a different size of JRD-1 draw die with its own punch. Taking a .308 to .284 is a one-step affair, and so is taking it to .277. But going on down to .264 is questionable. It can be done with some jackets and not with others. Or rather, it can always be done, but the results may not be acceptable to all bullet makers, for all jackets. Thinner, more brittle jackets may break through too often. Jackets with uneven anneal or slight variations in wall thickness may become exaggerated in these effects with large lobes appearing at the mouth (but all jackets will do this eventually, given enough reduction). Each draw of the jacket work hardens the material somewhat. Some materials with high zinc content may crack or be excessively hard to reduce in the next stage without annealing. Even pure copper may require an anneal to prevent small cracks at the base or mouth, depending on the thickness and specific grade (pure copper is a misnomer in most cases, because tiny amounts of other elements usually are present and affect the characteristics of the material). 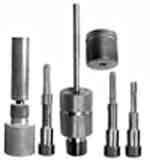 With theses limitations in mind, one can still do great things with a simple draw-down operation provided the dies and punches are properly shaped, hardened, polished, and sized for the specific job and material being used. There is some versatility, but it becomes partly luck if any of the parameters vary significantly from the original design and operation. That is, if you specify a reduction using a Corbin J-30-125 jacket and then try it with a J-4 1.3-inch jacket, it may or may not work the same, and certainly cannot be guaranteed to do so. Stuffing a jacket with thicker walls into a die set designed for one having thinner walls may break the die or bend the punch, unless the die was designed for reduction of walls (JRD-2). Making a substitution of lubricants, or changing the speed of the draw operation can also have a significant effect on how well the operation works. Usually, Corbin Swage Lube (CSL-2) is used to develop the clearances and angles in the die and punch set, and should be used to operate it in order to get the same results. Other lubes may work, or they may cause wrinkling, sticking, cracking...it is a guess. Likewise, the speed of operation can have an effect on the quality of the bullet jacket. A smooth, steady push that does not stop mid-point and start again is the best in most cases (if not, specific written instructions are sent with the die). Movement of the jacket through the die causes heating at the point of contact in the die. The friction generated within the metal itself, which is similar to the heat you get from bending a piece of wire back and forth, depends on how fast you move the press ram. The heat is neither good nor bad in itself. It is part of the equation, however, in developing the angles and clearances in the die and on the punch tip shape. If you move the ram very slowly, you generate less heat in the jacket, and it may not form as easily as if you use the same movement the die-maker used when he set up the appoach angle and punch tip shape. If you move it very fast, you may be fighting the inertia of the material and poke a hole through it instead of pushing it along with the punch. These are usually quite easy to notice and fix...if you know that they can happen and why. Add these items to the cost of the JRD-1 to determine your total equipment outlay for the longer, heavier jacket making if you also plan to swage the bullets (as opposed to selling the jackets themselves). If you need to maintain the same wall thickness as your previous, conventional jacket yet make a longer jacket, use the JRD-2 instead. It can reduce or maintain exact wall thickness, whereas the JRD-1 does not have wall thickness control. With the JRD-1 the jacket you use plus the amount of reduction you make will automatically determine the wall thickness and taper. Whether or not this is desirable or a problem depends on what your specific requirements. It can be either. JRD-1-R dies fit into the head of standard 7/8-14 reloading presses. The punch slips into the t-slot ram just like a standard RCBS type shell holder. A jacket is placed upside down over the punch (open end down, slipping over the punch) with a thin film of Corbin Swage Lube having been wiped on the punch and the OD of the jacket. The die is set one or two full turns into the press top, and the ram is raised. The die is then adjusted so that with the punch at the top of the stroke, the jacket just clears the tightest point in the die and can be further pushed out either by the punch itself, or by the next jacket. The object is to make sure that press is used at the end of the stroke for maximum leverage, making the drawing job easy. Even one or two more turns toward the ram can increase the force a great deal. One hand, gentle to firm pressure, is all that should be required. In Corbin presses, which have both a short and a long stroke mode, the press generally should be set to the long stroke (reloading) mode by moving the ram pin to the set of holes in the toggle arms closest to the end of the togle arms (maximum ram travel). On the CSP-1 press, remove the stop pin from the front of the press to use this longer stroke. On the CSP-2 press or the Hydro Press, no knock-out bar or retraction pin should be installed through the ram (these are used for swage dies, but not when drawing jackets or bullets). Jackets come in all lengths, so some draws may be done in the short stroke mode where the power is twice as great (half the effort) and some draws may require the long stroke mode in order to push the jacket far enough through the die to clear the smallest constriction. In any case, never push a jacket with another jacket unless the first jacket can move freely within the die. You can test this by using a cotton swab to try and lift the jacket and push it out the top. If you can do this, the jacket is being pushed past the tightest part of the die bore and is free, even if it is still inside the die. Another jacket can easily push it out the top. Otherwise, adjust the die so that you can achieve this result before processing a series of bullets, one after another. The JRD-1-S can be used with the RLA-B adapter bushing in the larger CSP-2 and Hydro Press. This can save you money by using one bushing (which comes free with the press) and several -S type dies in your -H press. The punch for -S draw dies has a 5/8-24 thread. The -H presses all have a 1-in x 12 thread. But there is an adapter called the CHP-S2H which converts -S draw punches to fit the -H rams. One adapter can be used for all your punches, as they simply screw into it just as they would in the -S press ram. The main reason is for the extra alignment, jacket length and strength. If you are drawing large diameters or making a large reduction clost to 30% of original size, you might prefer to use the tougher die to gain a bigger safety margin against breakage. Also, if you are making a very long draw, in the range of 1.3 or more inches of final jacket length, the -H press provides you with up to six inches of ram travel and the -H dies have longer, tougher punches since they are not restricted to the maximum of 4 inch ram travel in the -S press. Type -S dies are the same as type -R dies, but the punches are different. 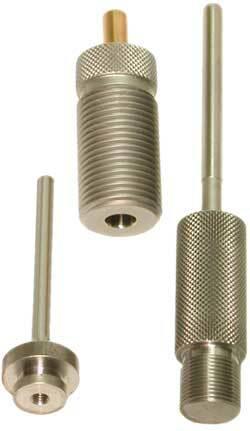 The -R punch has the button head and the -S punch has the 5/8-24 threaded head. You can get different punches and use them with the same -S or -R die, since the dies are identical. The price of -S and -R jacket draw dies is the same, since the sets are nearly the same and take about equal time to make. However, you have more power, alignment, and greater press strength (less strain on the press) if you use the S-Press instead of a reloading press. Cartridge cases can be used for making reasonably good bullet jackets. The 30% zinc alloy is more brittle but also stronger than the 5% to 10% zinc bullet jacket alloy (both use copper as the other metal and both are forms of brass). A 9mm spent cartridge case can be drawn down to a 308 caliber jacket for rifle bullets, usually in two stages (two different dies). The 9mm case is first drawn to an intermediate size, and then to .308 (actually about .3065 or so, so it can be filled with lead and expanded to .3080 in the swaging operations). A .40 caliber case can be turned into a .375 or .338 jacket. And you probably know about the .22 LR case that can be turned into a .224 or a .243 jacket, or even drawn to a .204 or a .172 jacket in additional stages. A case that has a rim or belt may require machine work (lathe turning) to remove the rim or belt before it can be drawn into a good jacket. Most cases first require that you knock out the primer. The primer is fairly tough, and resists compression. Once it has been removed, the small hole in the case head allows much lower pressure to be used in compressing the head to smaller diameter. The extraction groove in the case usually collapses on itself in a very even way, and either disappears completely in the final product or is reduced to a thin line that causes no more issue than would a cannelure ring on a factory bullet. The length of the case becomes greater as the diameter becomes smaller. An issue with cartridge case jackets is the heavy taper of the ID toward the base, much greater than with conventional bullet jackets. This is only a problem if one fails to recognize that the lead core must fit to the bottom of the jacket, and not trap air part way down the tapered ID. In other words, the diameter of the core may have to be considerably less than for a standard jacket in the same caliber. Likewise, seating a lead core at different depths, to make various styles or weights of bullet, could require more core seating punch diameters than would be necessary if the same were done in the less tapered conventional jacket. Accuracy with these improvised jackets has proven to be rather good. It is not "benchrest" by any means, but not far from what you might expect of an off-the-shelf factory bullet. Results will vary by the specific case being used, what caliber you make from it, and the style of bullet, so it isn't possible to make a general statement that applies equally in all situations. The general result is good, however, with minute of angle shooting frequently possible even when using discarded, low cost 9mm or 40 cases. If one expects only 2-3 inch groups at 100 yards, then a pleasant surprise is likely in nearly all instances. Cartridges that are necked, like the .17 rimfires or 30 Mauser, do not lend themselves to jacket making without first cutting off the reduced section of case. The punch which fits into the case needs to be as large as practical, to avoid shifting to one side and drawing the case lop-sided. Some of this can occur with a simple JRD-1-R type of die, but it normally isn't objectionable. The reloading press system doesn't lend itself to quite the same level of precision alignment as an actual swaging press. For the best results with large reduction amounts, the -H dies are the best choice (in a suitable CSP-2 or Hydro Press) because of their great length and press stroke, which allows for pre-alignment sections within the die body. Such pre-alignment or "nesting" designs are not usually suitable for shorter dies and press strokes except with short jackets, which generally don't require the feature in the first place.